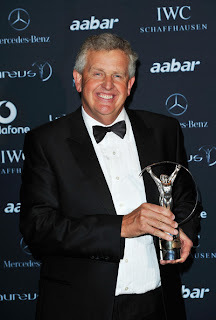 The Laureus World Sports Awards is the annual celebration of that achievement, when athletes from across the sporting spectrum are judged by the world's media and the legends of the Laureus World Sports Academy and the work of the Laureus Sport for Good Foundation is showcased. 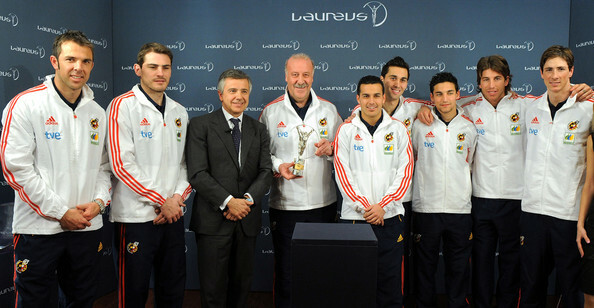 Laureus World Sports Awards ceremony was held in Abu Dhabi on February 7, 2011, where the winners of the Laureus Sports Awards were named and given awards. Rafeal Nadal undoubtedly one of the best tennis player in history went on to have a sublime 2010, which his achievements unmatched. He went on to win his Career Grand Slam after defeating Novak Djokovic in the US Open plus.He won the French Open plus Wimbledon , to win Grand Slam at all surfaces, the feat last done by Rod Laver in 1969. Nadal has now won nine career Grand Slams to lie seventh in the overall standings – at the age of just 24. Because he won the 2008 Olympic men’s singles gold medal, he has also achieved the so-called Golden Slam – all four Grand Slam titles and an Olympic gold medal. Rafeal Nadal also won the Internazionali BNL d’Italia, his fifth win in Rome, and the Madrid Open, where he beat arch-rival Roger Federer in the final to win a record 18th Masters title. This also brought him to the clean sweep on clay season , which was completed by winning all ATP Masters 1000 tournaments and the French Open , a feat done by no one before. Nadal was also nominated for the Laureus World Sportsman of the Year Award in 2009 and won the Laureus World Newcomer of the Year Award in 2006. It was an amazing run for Lindsey Vonn who has been the dominant women’s skier for three years. In 2010 she proved herself to be one of the greatest skiers of all time after another brilliant season.The American skiier won her third straight overall World Cup in 2009/10, and also won the Olympic Downhill gold medal in Vancouver in February. With these feats made her the the first American woman to do so . She despite suffering from injury before the downhill, went on to show the qualities of a true champion. She went on to beat US rival Julia Mancuso by 0.56 seconds to win the gold medal.In a glittering career, at the age of just 26, she has already recorded 33 World Cup wins in four disciplines - Downhill, Super G, Slalom and Super Combined. She has also won two World Championship gold medals.She has become the most successful American women skier in World Cup history and the first American to win three successive World Cup titles. 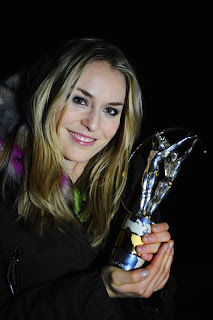 This is third time straight year Lindsey Vonn has been nominated for the Laureus World Sportswoman of the Year Award. In 2009 she was beaten to the Award by Yelena Isinbayeva and in 2010 by Serena Williams. Spanish football fans were totally rampant after their national team triumphantly won their first ever FIFA World Cup in July,2010.In a action packed final Spain went on to beat Netherlands 1-0 , with a goal coming from Andres Iniesta after being given the extra time. Spain are also the current European Champions which confirms their place at the summit of world football. It made them the first European team to win a World Cup outside its own continent. 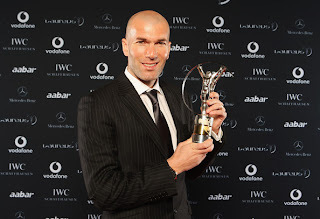 Following the victory in South Africa, seven Spanish players were nominated for the FIFA World Player of the Year Award - Xabi Alonso, Iker Casillas, Cesc Fabregas, Andres Iniesta, Carles Puyol, David Villa and Xavi. Two of them – Andres Iniesta and Xavi – made the shortlist of three. Martin Kaymer had a terrific 2010 as he went on to win the US PGA Championship - his first major championship - at Whistling Straits, and finished the year as Europe’s No 1 player. 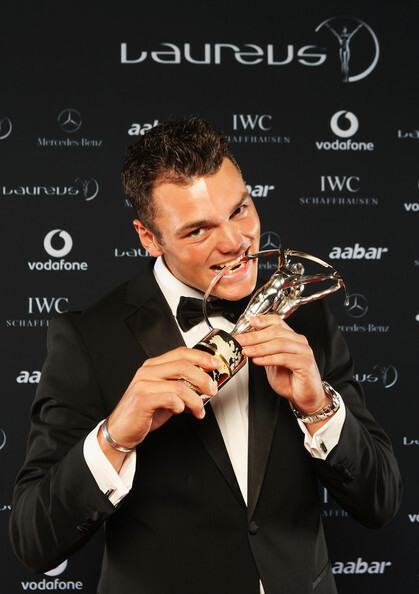 Kaymer was one of the torch-bearers in a superlative year for European golf as three of the four major championships were won by European Tour players. Kaymer,also became the youngest European No 1 for 21 years, since Ronan Rafferty in 1989.During the year he also won the Abu Dhabi Golf Championship in January, the KLM Open in September and the Alfred Dunhill Links Championship in October. He was also a member of the winning European Ryder Cup team and finished the year as World No 3. Kaymer also became the first German to win the US PGA Championship and only the second German, after Bernhard Langer, to win a major championship. He finished in a tie at 11-under-par, then beat American Bubba Watson in a play-off. 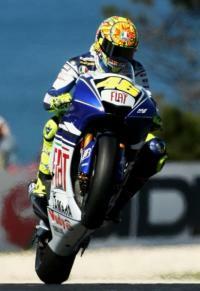 Valentino Rossi, was without any doubt the favourite contender for the World MotoGP championship in 2010. He went out to win the first race in Qatar as Stoner went on the crash out. But people's expectations went on a six when Rossi injured his shoulder while training for a moto-cross bike after Japanese Grand Prix,making things worsen he crashed out in a second free practive session, while making a corner at 120mph displaced compound fracture on his right leg. With injury of such gross magnitude , had made his opportunity to win the Grand Prix had diminished but just after 41 days after accident, he went on to win the Malaysian Grand Prix in Sepang. Visually impaired skier Verena Bentele has won an amazing collection of medals since her first Winter Olympics in 1998, but the highlight was undoubtedly the 2010 Winter Paralympic Games in Vancouver when she won five gold medals. Now aged 28, she showed her immense versatility in Vancouver by winning cross-country gold medals across a wide range of distances – the 1km Sprint Classic, 5km Free and 15km Free. She also took biathlon gold medals for 12.5km and 3km Pursuit. As a 16-year-old, Verena won her first four medals at the Paralympic Winter Games in Nagano in 1998 – one gold, two silver and one bronze. Four years later, she won four gold medals in Salt Lake City 2002, which she followed with two gold and one bronze medal in Turin in 2006. The surfing master Kelly Slater notched his most dominant year yet. Claiming his unprecedented ninth world title in 2008, Slater took first in six of the 10 contests he entered. His 8,832 points this year absolutely dwarfed the 6,780 of his nearest competitor. Slater did not even plan to compete in 2008, giving his rivals a sense of confidence that his later change-of-mind quickly dashed. Zinedine Zidane the frenchmen was one of the driving forces behind France's success in reaching the final of the 2006 FIFA World Cup in Germany. But all that ended in a lilttle disgrace as he headbutt during that match, and earned the most famous red card in football history. Zidane announced his retirement from international football after France were knocked out of the European Championship by Greece in 2004. But a little over a year later, with France experiencing serious problems in qualifying for the 2006 World Cup, Zidane announced that he would come out of international retirement to help the team and he was reinstated as captain in August 2005. It was Zidane's second World Cup final ,also his last international game he scored in the 7th minute from the penalty spot It made him one of only four footballers to achieve the feat of scoring in two different World Cup finals, sharing the honour with Pelé, Paul Breitner and Vavá. The goal also made him one of the top goalscorers in World Cup final matches, with three goals, tied for first place with Pelé, Geoff Hurst and Vavá. Zidane, a three-times FIFA World Footballer of the Year, played 108 times for France, and is one of only four players to make over 100 appearances, the others being Marcel Desailly, Didier Deschamps and Lilian Thuram. May El-Khalil is a symbol of inspiration for those who believe in the power of sport. She met almost a fatal accident in 2001, and it was not even certain if she would be able to walk again. Once recovered and out of Beirut hospital, following more than 20 operations, as President of the Beirut Marathon Association, in 2003 she launched the first Beirut Marathon, which attracted 6,000 runners and hundreds of volunteers, of a variety of ages, backgrounds and cultures, all forgetting their differences and working together to create a sporting event which made a massive social statement on behalf of the people of Lebanon. Since then the race has seen tremendous growth, regularly attracting more than 20,000 participants, and it has proved a powerful unifying factor in the country. It has become a turning point in the history of political reconciliation in Lebanon; a triumph of the spirit and an example of sport rising above a hostile political environment. Europe won the biennial Ryder Cup match against the United States at Celtic Manor in South Wales in October. The three-day match was weather affected,the European team, captained by Colin Montgomerie beat the Americans, captained by Corey Pavin, by 14½-13½. The result came down to the last match of the 12 singles on the final day between Europe’s Graeme McDowell and Hunter Mahan from the United States, with US Open champion McDowell winning on the 17th green. The European Ryder Cup Team was Luke Donald, Ross Fisher, Peter Hanson, Padraig Harrington, Miguel Angel Jimenez, Graeme McDowell, Edoardo Molinari, Francesco Molinari, Ian Poulter, Martin Kaymer, Rory McIlroy and world No 1 Lee Westwood.Ian Poulter was Europe's leading scorer with three points from a possible four, while there was special delight for veteran Miguel Angel Jimenez who won his first singles match after four Ryder Cups, beating Bubba Watson 4&3.